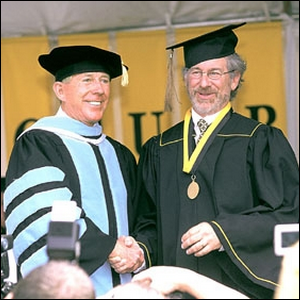 Steven Spielberg Submitted Which Of His Films As A College Graduation Requirement? The World's Smallest Deer Is The? In 1969 Steven Spielberg dropped out of college a few classes short of completing his bachelor’s degree in the arts. While dropping out of school is typically advised against, Spielberg wisely chose to focus on his career: at the time he dropped out, he had already directed one short film and became the youngest director to ever be signed for a long-term deal with a major Hollywood studio. That was just the beginning for the soon-to-be-acclaimed director who, over the ensuing decades would go on to work on a staggering number of acclaimed films like E.T. the Extra-Terrestrial, Saving Private Ryan, Jaws, Jurassic Park, the Indiana Jones series, and Schindler’s List to name but a few of the many films he is well known for. It’s that last film we listed, Schindler’s List, that actually helped Spielberg wrap up that unfinished arts degree. In 2002, over thirty years after he stopped working on his degree at the University of California, he finally graduated. By completing some independent study work and submitting Schindler’s List as his capstone film project (in place of the traditional 12 minute short film expected from graduating seniors), he was able to stroll across the stage to pick up his long placed-aside college degree. Image courtesy of California State University.